In addition to our monthly sponsorship for CBSM School in Kimilili we wanted to visit on site to get to know the school, people and especially the kids. In January 2018 we travelled to Kimilili for a two weeks voluntary stay. Our journey to Kimilili was well organised. We were picked up at the airport hotel where we arrived and were accompanied all the way to Kimilili. Every one we met in Kimilili gave us a warm welcome. Everyone was friendly, helpful and interested to interact. After two days of getting to know people, campus and the village we started pursue activities aimed to support the kids. The first activity we started to do was to paint ECD-School that was until then only plain corrugated metal. With the help of Christina Amann and some teachers we painted the Kenyan all along the bottom of the front side. Above the flag large letters of the alphabet were painted in all colours. 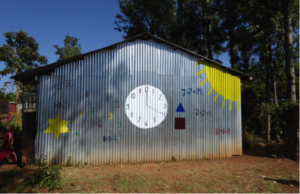 The other side of the building was painted with basic mathematical equations, a large clock and shapes (rectangle, triangle and star). To help the current Form IV students evaluating job opportunities, we started a counselling program. We asked all Form IVs to prepare a short CV with their job preferences, hobbies, skills and career plans. After grouping and summarizing the feedback received we held feedback sessions in small groups where we explained requirements and backgrounds for the specific area of interest. We also gave them a picture of alternative job opportunities that might also catch their interest. Also university fees and costs of living were discussed before they got the chance to ask various questions. Madame Vane and Paul Stephens were very supportive all through the counselling works. 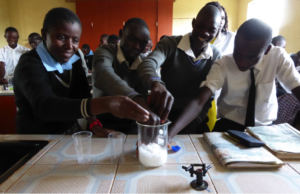 Due to Lucy’s background in bio-technology and science we were able to bring some experiments to do with the current Form II and Form III students. First we introduced them to the basics of Nano-technology. We used cubes and a sticky pad to visualise the background of Nano-technology. As a highlight students could make magic-snow by themselves. As they had never seen or touched snow before it was a stunning experiment for them. The highlight for ECD School was the Coca-Cola/Mentos bomb in the school-yard followed by some chocolate for everyone. Taste and consistency was new for most of the kids which lead to very dirty mouths and fingers. It was a pleasure meeting everyone in Kimilili and we hope we could add some benefits. In our opinion still lots of work needs to be done and the various groups of volunteers planning to spend time in Kimilili will add more benefit.